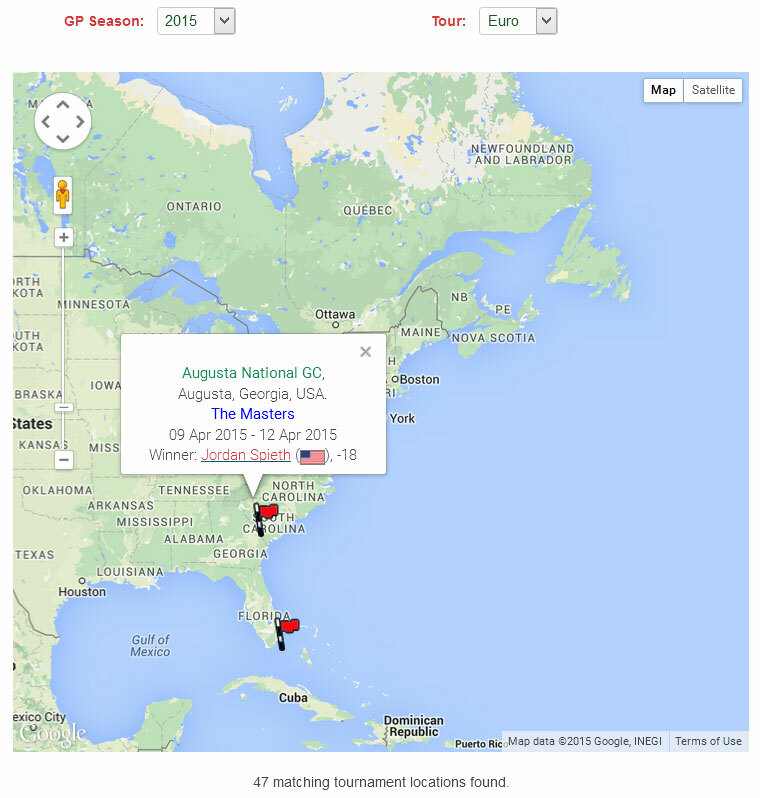 I have made a small, but useful enhancement to the pop-up markers on the Google Maps pages on Golf Predictor. The markers on these two pages, one for all the tournaments in a season on the selected tour and one for all the tournaments in a season for a selected golfer, now link to the relevant pages on Golf Predictor, instead of being simple text (basically, all the coloured text on the markers are now links). For example, clicking on the tournament name, course name or winner name on the Tournament Locations page will now take you to the tournament page, course page and golfer result page on the site respectively. The screenshot above shows the new marker for the 2015 US Masters, with the cursor (not shown) hovering over the winner's name. This changes the cursor to a hand and also underlines the link text, as shown above. Similarly, on the pop-up modal window which shows a golfer's tournaments in a season on a map on the Results by Player page, you can link to the relevant pages. However, in this case, because it is in a modal window, the link destinations are opened in a new browser window/tab. In addition, the styling on modal pop-ups is different and the linked text is not underlined when you hover over it.